SSC CGL Tier-2 2017 Exam Date Postponed Once Again : Check Here New Official Exam Dates released by SSC. Staff Selection Commission(SSC) has postponed the exam date of SSC CGL2017 Tier-2 Online Examination once again as per official notice released by SSC today. 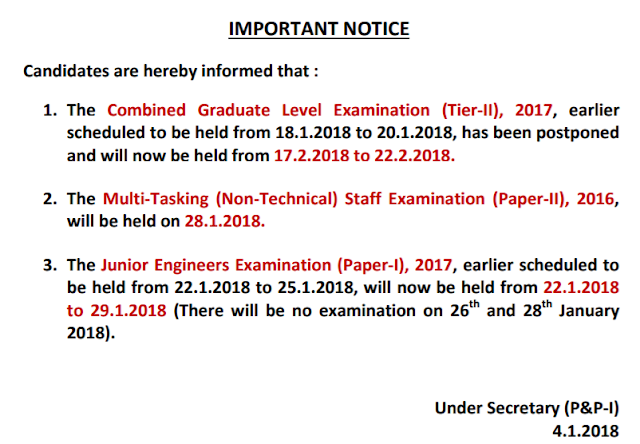 The Combined Graduate Level Examination SSC CGL (Tier-II), 2017-18 earlier was scheduled to be held from 18.1.2018 to 20.1.2018, has been now postponed and will now be held from 17.2.2018 to 22.2.2018.
and will now be held from 17.2.2018 to 22.2.2018. All The best for SSC CGL 2017 Tier 2 Examination. Great post. i really appreciate this blog. Its very helpful and informative blog SSC CGL Coaching Center in Tirupati.